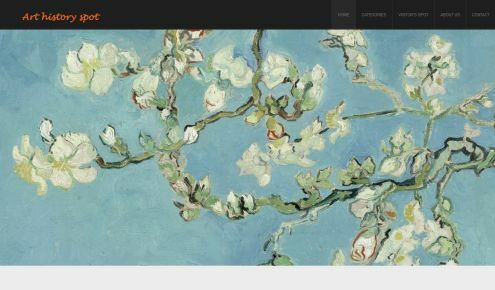 The following is a preliminary guide to journals, newsletters and blogs for art history that are available to access free online. We have selected websites for their academic content and for their value as sources of illustrations. 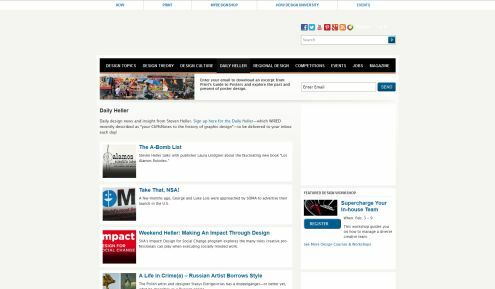 The table below breaks down the journals, newsletters and blogs by theme or subject, with the links and brief descriptions sorted alphabetically beneath it. Originally called Journey Around My Skull, 50Watts was started in August 2007 by Will Schofield who continues to ‘curate’ the site. 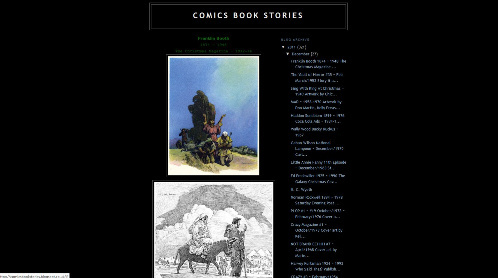 It contains something like 700 well-illustrated blogs on the art and history of book and magazine illustration. It has a search facility. Alberti’s Window has been issued continuously since July 2007. 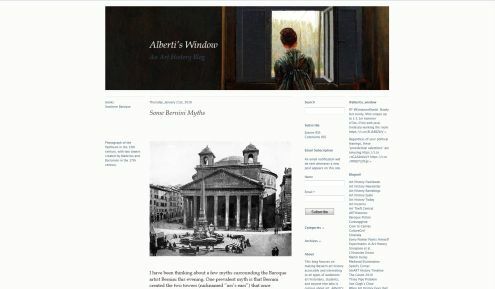 The aim of the blog is to make Western art history accessible and interesting to all types of audiences: art historians, students, and anyone who may be interested in art. It is maintained by Monica Bowen, a professor in the art history department at Seattle University. The blog contains a search facility. Not strictly a blog, but an archive of the numerous articles on art history written by British historian Andrew Graham-Dixon for The Independent, The Sunday Times, and other publications since the late 1980s. Contains a search facility. 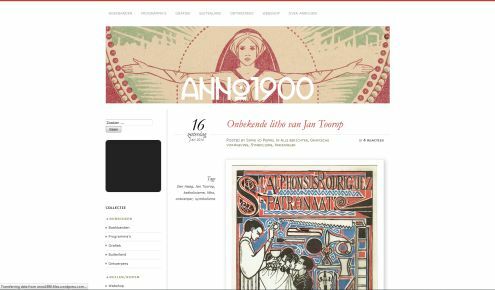 Anno 1900 is a blog that was started by Spike van de Peppel. It focuses primarily on the influence of Art Nouveau in The Netherlands, but also elsewhere. It is well keyword indexed and has a search facility. The text is in Dutch. 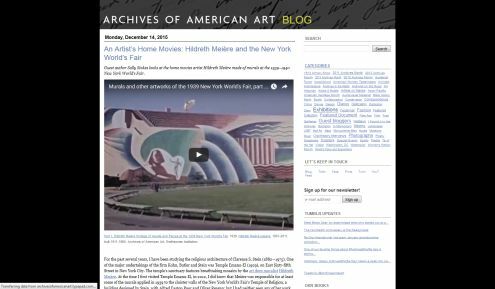 The Archives of American Art Blog is the official blog of the Smithsonian Institution’s Archives of American Art. Contains long, well-illustrated, informative, and often entertaining signed articles on American art history. Some of the articles include embedded video clips. Includes a search facility. 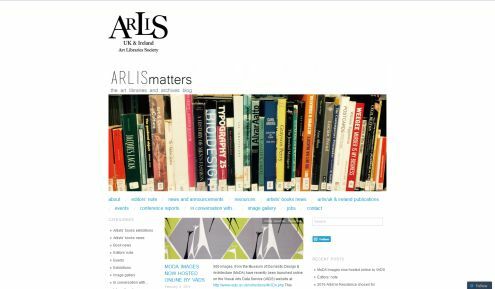 In addition to containing news and information about art libraries and the art library profession in Britain and Ireland, the blog also contains book news; details of current and forthcoming art exhibitions, conferences, workshops and events; interviews; reports on online resources. 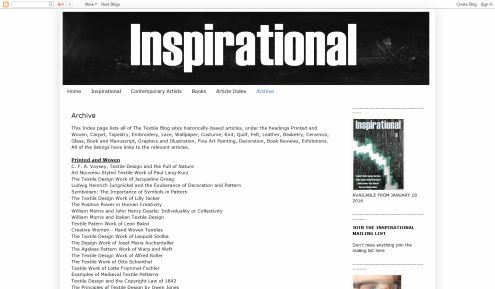 Art History Spot contains an eclectic range of articles by various authors on a wide range of art history topics. The blog is not indexed but lists articles by broad categories, e.g. Renaissance and Baroque Art, 19th Century Art. 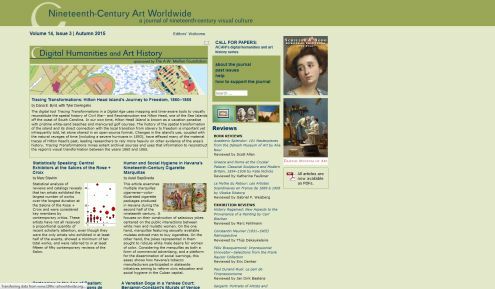 Art History Today is not just a blog. 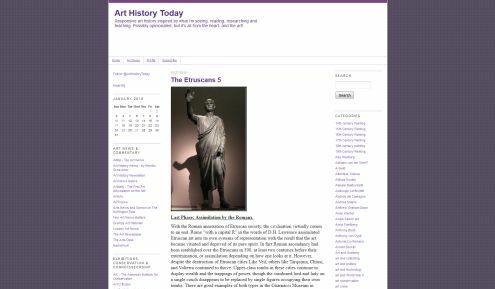 It contains a wealth of information on digital sources that can be used for art history research. It is compiled by Dr David Packwood, who is authority on Nicholas Poussin. Usefully Art History Today includes a search facility, the absence of which can sometimes reduce the value of otherwise very good blogs. 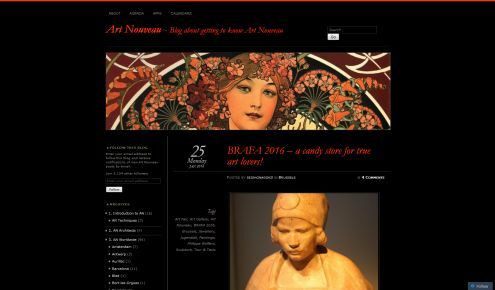 About Art Nouveau is a blog started by Olga Harmsen in 2012. It contains a series of well-illustrated reports on visits her to various cities throughout the world in which she records evidence of the influence of Art Nouveau. 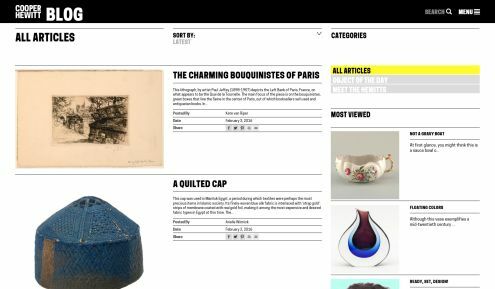 Se also includes profiles of leading Art Nouveau artists and architects, and links to relevant web sites. Well indexed and has a search facility. 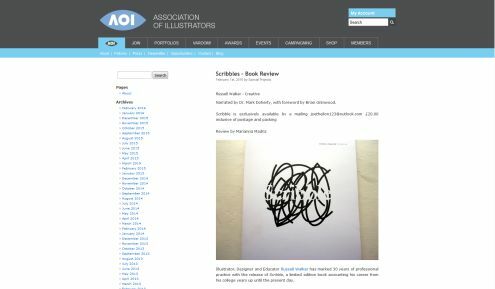 The AOI Blog is the official blog of the British Association of Illustrators. It was started in July 2009 and contains news of the Association’s activities; reports on work by its members; and brief articles/blogs on the history of illustration. Includes a search facility. 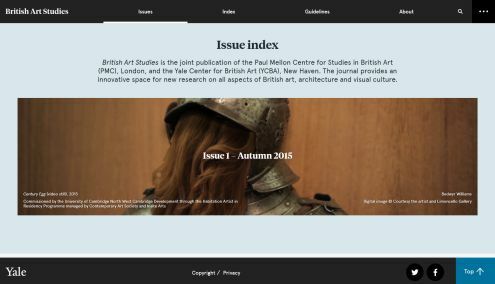 [ISSN2058-5462] Issue 1 – Autumn 2015 British Art Studies is the joint publication of the Paul Mellon Centre for Studies in British Art (PMC), London, and the Yale Center for British Art (YCBA), New Haven. The journal provides an innovative space for new research on all aspects of British art, architecture and visual culture. Caravaggio is a blog dedicated to the life and work of the painter Michelangelo Merisi da Caravaggio (1571-1610). The Blog was issued regularly from August 2009 to November 2014. It contains a search facility and a guide to other digital sources on Caravaggio. The Cooper Hewitt Blog is the official blog of the Cooper Hewitt Smithsonian Design Museum in New York. 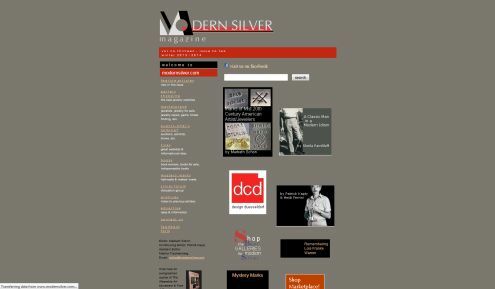 Contains a wealth of short signed articles or blogs on the history of design and the decorative arts. Although it has a search facility, it would be useful it had an index that could be browsed. 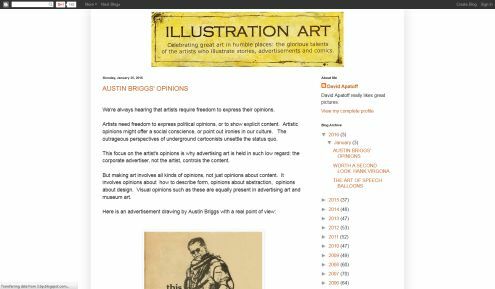 Illustration Art is a blog researched, compiled and written by David Apatoff. It has been issued frequently since 2005 and contains short, often well-illustrated articles the history of illustration. The blog has a search facility. 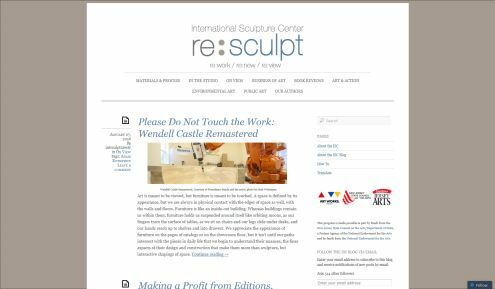 The ISC Blog is the blog of the International Sculpture Center, a non-profit organization founded by sculptors in 1960 with a mission to “champion the creation and understanding of sculpture and its unique, vital contribution to society.” The blog provides a forum for discourse on sculpture among artists worldwide. It includes a search facility. 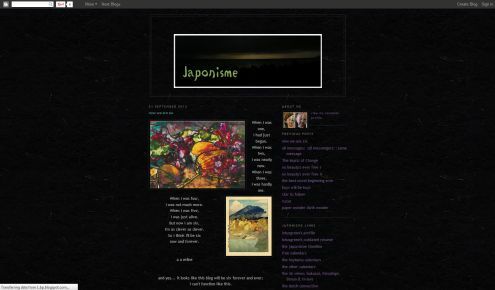 Japonisme is a blog that was issued between 2006-2012. It's a hotchpotch of text and images that explore the influence of Japanese culture on Western visual art. The blog is well indexed. It is unclear if this blog has ceased or just been suspended. Issue.1, Spring 2016- Launched in Spring 2016, Journal18 “explores the multilayered nature of eighteenth-century art. Our focus will be on artworks that bear traces of multiple hands as a result of workshop production, cross-cultural exchange, re-use, restoration, vandalism, or other factors. Among the questions we aim to consider: who were the many people involved in art’s production and reproduction (artists, collectors, scholars, dealers, handlers, and restorers)? How were eighteenth-century artworks made, repurposed, transported, and conserved? How were they translated across media as well as across time, space, and culture? And what is the creative effect of non-creative acts like accidents or defacement? By taking a ‘multilayered’ approach, we wish not only to reexamine traditional art historical categories – such as style, originality, or authorship – but also to encourage new methodological perspectives and to find new meaning in the materiality of art objects.” [Editorial note]. 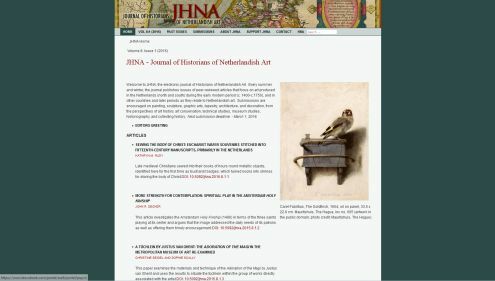 Volume 1, Issue 1, 2009- The JHNA is the electronic journal of the Historians of Netherlandish Art. It is issued twice a year – Summer and Winter. It contains peer-reviewed articles on art produced in the Netherlands (north and south) during the years c.1400- c.1750, and in other countries and later periods as they relate to Netherlandish art. Submissions are encouraged on painting, sculpture, graphic arts, tapestry, architecture, and decoration, from the perspectives of art history, art conservation, technical studies, museum studies, historiography, and collecting history. [Editorial note]. 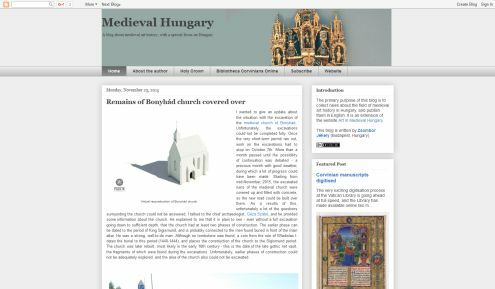 Medieval Hungary is a blog about medieval art history, with a special focus on Hungary. The blog was started in October 2010 and is maintained and edited by the Hungarian art historian Dr. Zsombor Jékely. Contains a search facility. 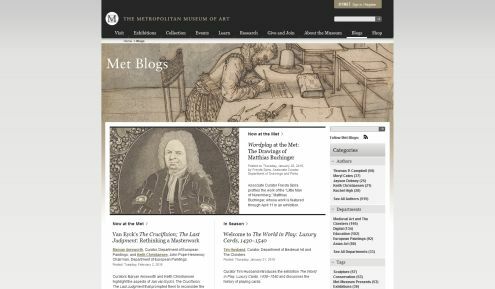 The Met Blog is the official blog of the Metropolitan Museum of Art in New York City. Similar in format to the V&A Blog but with less gallery news. Contains, long, wellillustrated signed articles on aspects of art history relevant to the Met’s various collections. 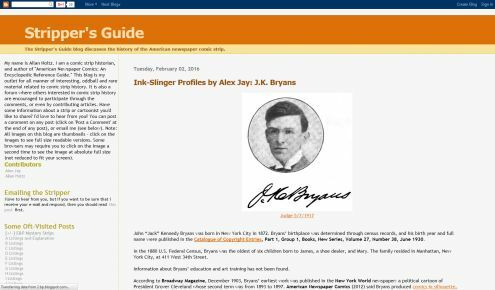 The blog can be searched by categories (departments), author, and by tags. The National Portrait Gallery Blog is the official blog of the National Portrait Gallery in London. Contains short, signed, illustrated postings on British portraiture. 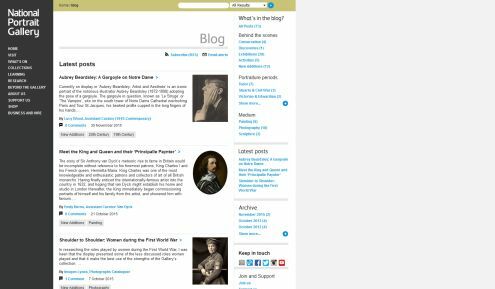 News from Anywhere is a blog sponsored by the William Morris Society and issued since 2008. It is an important source on Morris and his circle. It contains a search facility. Volume 1, No.1, Spring 2002- Founded in 2002, Nineteenth-Century Art Worldwide is a scholarly, refereed e-journal devoted to the study of nineteenth-century painting, sculpture, graphic arts, photography, architecture, and decorative arts across the globe. 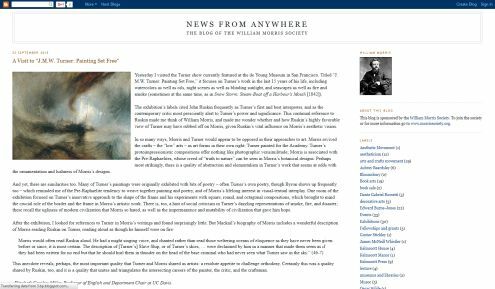 In addition to articles, Nineteenth-Century Art Worldwide publishes book and exhibition reviews. The goal of the journal, is the expansion--especially the geographical expansion--of the nineteenth-century canon, and, relatedly, the demonstration of the interconnectedness of the artistic achievements of different nations.. Issued usually twice a year. 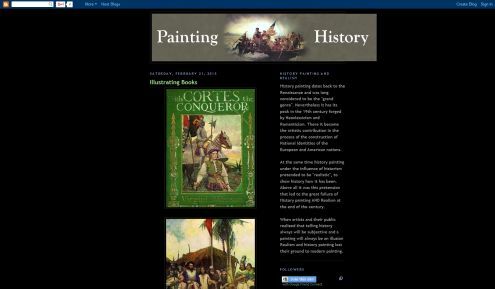 Painting History is a blog devoted to the subject of history painting issued regularly since 2009. It is well illustrated and contains an index to artists and subjects. Panorama is the first peer-reviewed electronic publication dedicated to American art and visual culture (broadly defined) from the colonial period to the present day. 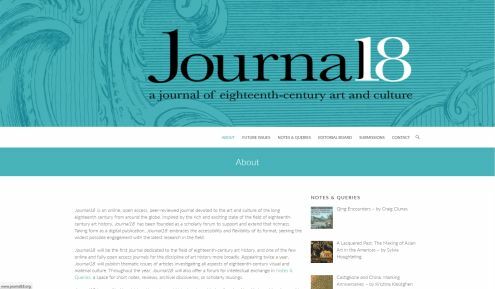 The journal, which has been issued since Winter 2015,l is intended to provide a high-caliber international forum for disseminating original research and scholarship and for sustaining a lively engagement with intellectual developments and methodological debates in art history, visual and material cultural studies, and curatorial work. It encourages a broad range of perspectives and approaches within an interdisciplinary framework encompassing both local and global contexts. Panorama welcomes submissions that utilize the insights of both traditional and new historical and interpretive approaches to American art. 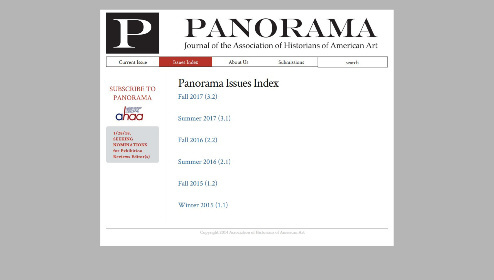 Panorama is published twice a year; past issues will be archived on the journal website. In addition to peer-reviewed scholarly articles, Panorama publishes Book Reviews, Exhibition Reviews, and shorter Research Notes, and will regularly feature The Bully Pulpit—a section pairing short scholarly and polemical texts with responses from academics, curators, critics, and other interpreters of American art and visual culture. 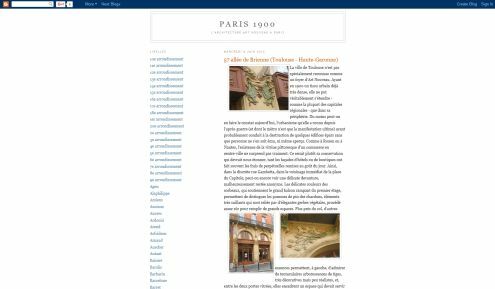 Paris 1900 is a blog that has been issued continuously since November 2007. It probably the best online source on the influence of the Art Nouveau style on the architecture of Paris. It also includes reports on the manifestation of Art Nouveau elsewhere in Europe. The blog is comprehensively indexed and contains a search facility. The text is in French. 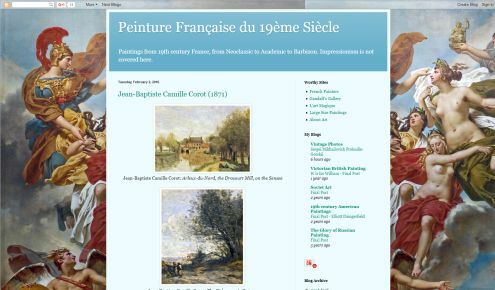 Peinture Française du 19ème Siècle is a blog that has been issued regularly since January 2013. It focuses on nineteenth century French painting, from Neoclassic to Academic to Barbizon, with the exclusion of Impressionism. It includes a search facility. 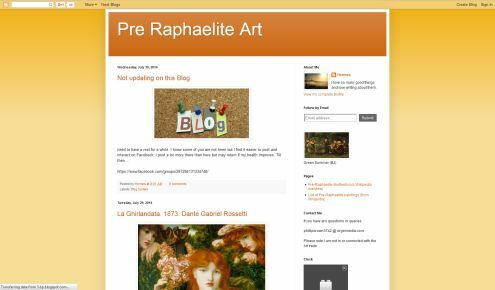 Pre Raphaelite Art is a blog that explores various facets of the Pre- Raphaelite movement and its influence on art and literature. The blog was begun in 2009 and suspended in 2014. When checked in January 2016, the search facility did not work. 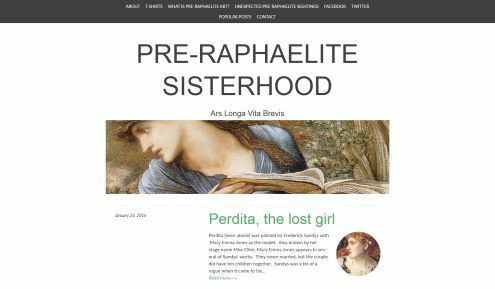 The Pre-Raphaeelite Sisterhood is a blog dedicated to the women associated with the Pre-Raphaelite Brotherhood as artists, writers, models or muses. The blog is compiled by Stephanie Graham Piña, an independent scholar who since 2004 has also maintained a website and blog on the artist/model Lizzie Siddal http://lizziesiddal.com/portal/ Pre-Raphaeelite Sisterhood contains a search facility. Quad Royal is a blog about British posters of the 1940s, 1950s, and sometimes, the 1960s. It has been issued regularly since January 2010. As well as short, informative and well-illustrated articles on the poster designers and the art of the poster, the blog also contains news about recent and forthcoming exhibitions, a bibliography on the history of the poster, a list of poster dealers, and links to other Internet sources on the poster. The blog contains a search facility. 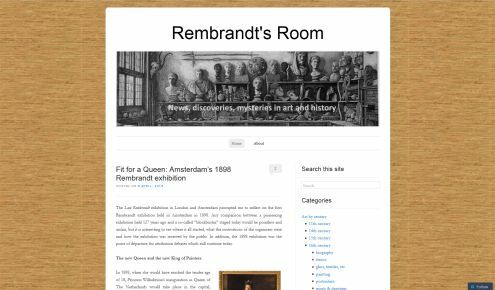 Rembrandt’s Room was started and is maintained by the Dutch art historian Maaike Dirks. The focus is primarily, but not exclusively, on Netherlandish art from the 11th to the 21st century. The blog is very well indexed and has a search facility. Stripper’s Guide is a blog on the history of the American newspaper comic strip. It has been issued continuously since October 2005, and was started and is maintained by the Allan Holtz, author of ‘American Newspaper Comics: An Encyclopedic Reference Guide’. It includes a search facility. 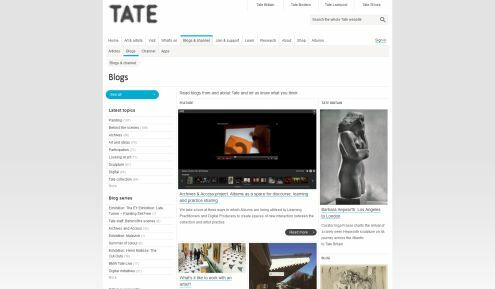 The Tate Blog is the official blog of the Tate art galleries in England. 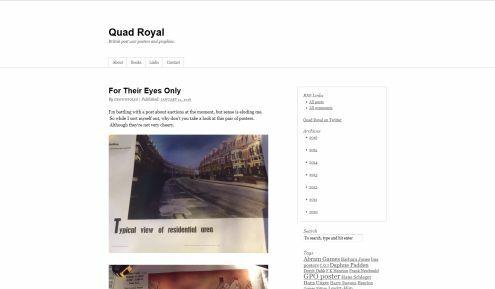 As of January 2016 it contains something like thousand archived short articles or blogs dating back to 2005, including over 270 listed under the History of Art, 55 on The Bauhaus, 51 on the Pre-Raphaelites, 45 on Post-Impressionism, 102 on Surrealism, etc. 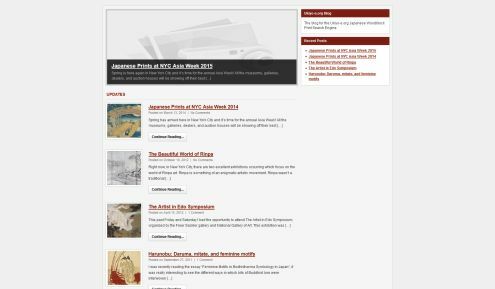 Ujiyo-e-org blog is a blog attached to devoted to Ukiyo-e. 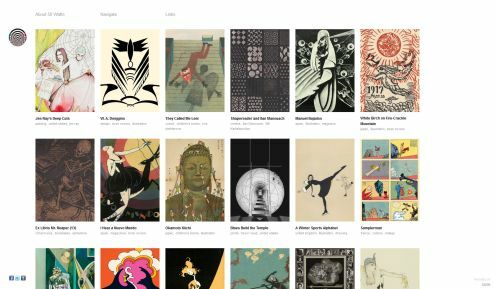 It is a website devoted to the art of the Japanese woodblock print, which currently (2016), contains images of nearly a quarter of a million prints. 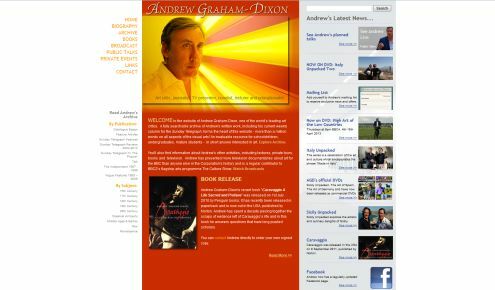 Both the blog and the website have a search facility. 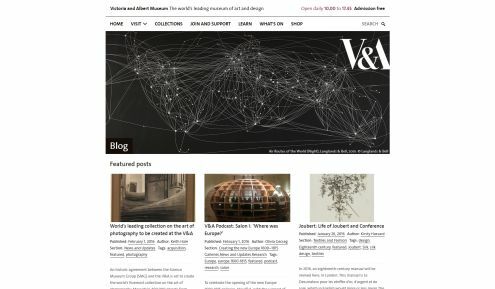 The V&A Blog is the official blog of the Victoria & Albert Museum in London and has been issued since at least 2007. Contains gallery news, details of current and forthcoming exhibitions, and numerous signed articles on all aspects of art history. Although it does not have a search facility, all past postings can been displayed by heading. 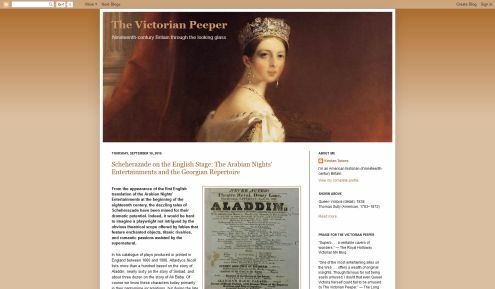 The Victorian Peeper is a blog compiled and maintained by the American historian Dr. Kristan Tetens. 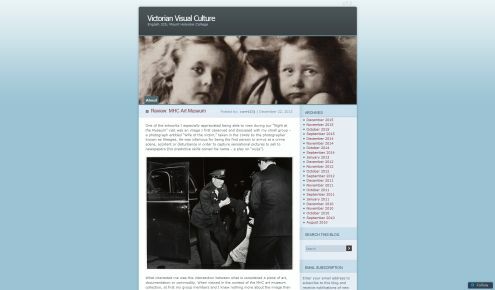 It is one of the most comprehensive online resources on 19th century British visual culture. In addition to numerous articles posted over several years, it also contains news of current and forthcoming exhibitions; details of relevant places to visit; a list of endangered Victorian buildings; search tools, other sites of interest, etc. The blog contains a search facility. Victorian Visual Culture is a blog that has been posted regularly by Mount Holyoke College in South Hadley, Massachusetts since 2009. It contains reflections of various lengths on aspects of Victorian art and literature. Usefully, it contains a search facility. 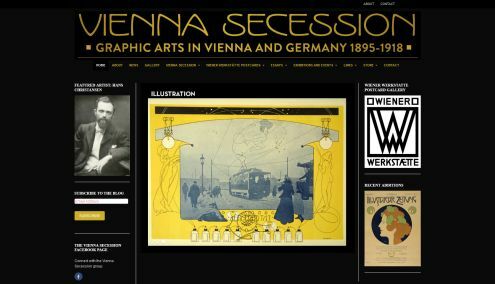 Vienna Secession is a web site with a blog. It was established by the Venezuelan-born Canadian artist Robert Rosenman in December 2011 and is one of the best online sources in English on the graphics of the Secession, Wiener Werkstätte and Jugendstil. Contains a search facility.